So I'm watching this video about a farm in Portugal, and I have to say that it looks great. 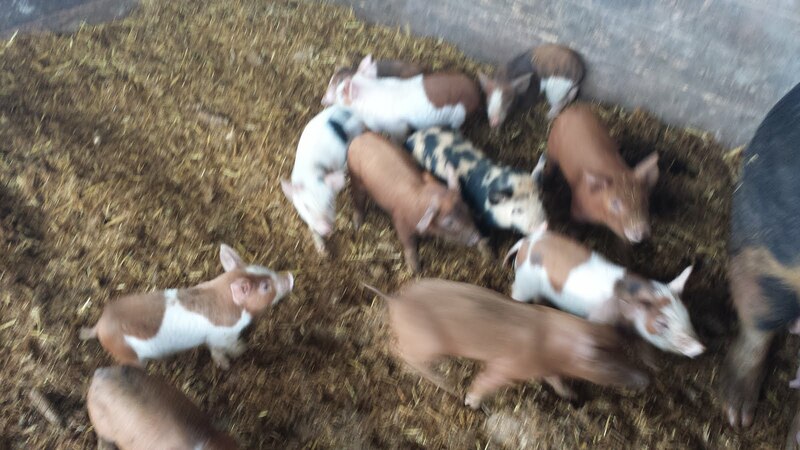 Happy piglets on the sow; flocks of turkeys, sheep, cows, green vegetables. Growing small quantities of a large variety of crops. He talks about how animals eat different things, so following cows with sheep and then with turkeys gets more use out of the land, and there's excepts of a dining room and happy people eating the food (they presumably grew) from the farm. But I was jarred out of my revery by one statement, by a cook/chef: "I cook the food for the farmers markets and for the volunteers". Sure, they did show a couple of people that probably get some sort of pay for the farm, but when I looked carefully at the farm, it's one of those role model farms. you know, the ones that are impossibly clean and straight-laced - the way that only thousands of hours of hand-labor can produce. You see these farms offering "internships", or offering people stays as wwoofers. You know those guys with the signs on the side of the road that say "Will work for food?" -- why does it seem that every single one of these farms, offered as a shining example of how a farm should be -- seem to be a variation on slave labor? I don't ask people to work for me for free, or just for food and housing. that's not the contract that I'd take the other end of - would you? If you work, and farming is work, don't get me wrong - you should get paid for that work, and the pay you get should allow you to cover all of your basic expenses (like that farm food), rent, clothes, health care and, horrors! savings. You should earn more than you spend. Ideally, if your goal is farming, your job should produce enough that you can chase your own farm dream. 1) Everyone gets a wage. if you aren't profitable enough to pay your workers, you shouldn't be in business. Period. No excuses. Can't figure out how to do that? Get out of farming. Get out of business. Don't care what your business is; can't make a profit, leave it to someone who can. If you can't figure out how to do it, don't complain about the people who do -- appreciate them. Conventional farmers, for the most part, have figured this out. You figure it out, too. 2) You have to make a profit. Sorry if that conflicts with some ideal you have. figure out a way to make a profit with your ideals. Or adopt different ones. Because sustainable means IN BUSINESS, not bankrupt or subsidized by anyone (like your workers) or a non-profit or whatever. Make enough money in the good years you can sustain yourself through the bad ones. Appreciate folks who do this. Conventional farmers have figured this out. You figure it out, too. 3) Tell the truth. If you publicize your farm operation, don't tell me what you'd like to do, tell me what you do. Don't talk a different story than your walk. If things are going right, by all means, there's lots of folks who love a good story. But if it's fiction, label it as such. Don't lead some poor new farmer down the garden path. Same is true for any other industry, by the way. Sorry I haven't blogged much in the last few days or week. Couple of farm projects have been calling me, and now it's planting time. This is the time of year when my schedule isn't really in my control; I'm mostly out trying to get any dirt work done in short weather windows. The weather this year has been unseasonably warm; we've had days in the 70s, which for april is unusual; and a little bit of rain, but not as much as usual. That means that the conditions are right for seed-bed preparation, which for me means good quality tractor-time. It's my chance to listen to that audio book or podcast that I made a note of; i try to save them up so that I can slip on the earphones and drive in straight rows. 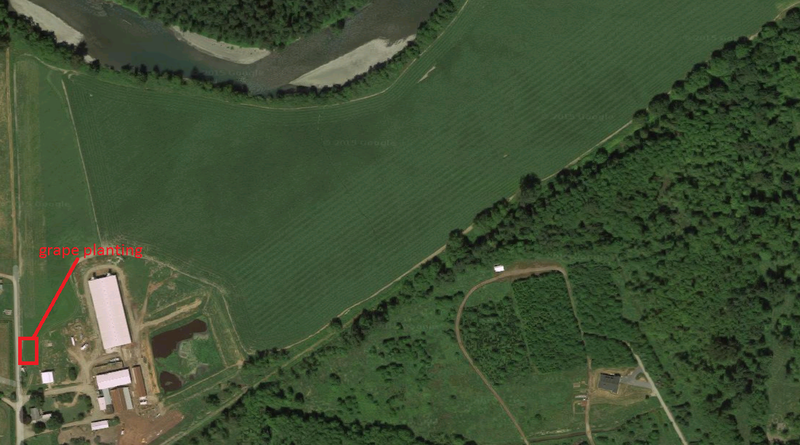 you'll notice that there's a big patch in the middle that isn't marked as a crop; that's because the alfalfa-grass and alfalfa that I planted in 2014 are doing great; very happy with the growth, plenty of good forage potential, got 4 cuttings off of it last year, can't say enough good stuff about it. So for this year there's no planting or tilling activity there at all; grazing and harvesting the forage is about it. On the far left-side is a long thin strip labeld buckwheat test. Now that my neighbor to the west and I have reached an agreement on where the property line is, I'll be adjusting my fence to it, and the strip of ground that opens up I'll till and plant buckwheat on. I don't know what I'll do to harvest it; I may plow it under, or graze it off, or even try harvesting a little as grain, but that's something I'll decide later. I want a fast-growing crop that I can use to cover disturbed ground, like around water troughs, and I want to see how it grows. The vinyard is new, and it's a little tiny purple square at the lower left hand corner. It'll be 3 years before I see grapes, but I did put some berries in while I was at it, so I'll see some marionberries next year. love marion berries. Winter squash grow pretty well around here and I'm putting in a couple of acres of them. Last year I spaced the squash at 6 to 8' intervals, this year I'm going with 4' intervals in the rows, with 8' between the rows. I'm also going to be trying black plastic mulch to surpress as many weeds as possible without hand-weeding, which is what I did last year and it sucked. Grain corn experiment is the yellow square right above the squash. I'm going to plant a different variety of corn, and hope that it ripens enough that I can harvest it as grain corn. I can harvest it by hand into a corn crib, or find someone with a combine around here, or maybe buy me a john deere 6600 type combine and do it myself. But I don't have to do anything until fall; just plant it now and come up with some scheme to weed it. Thinking about locating a rotary hoe and trying that. Rework area (in red, left bottom) is a difficult area of ground for me. 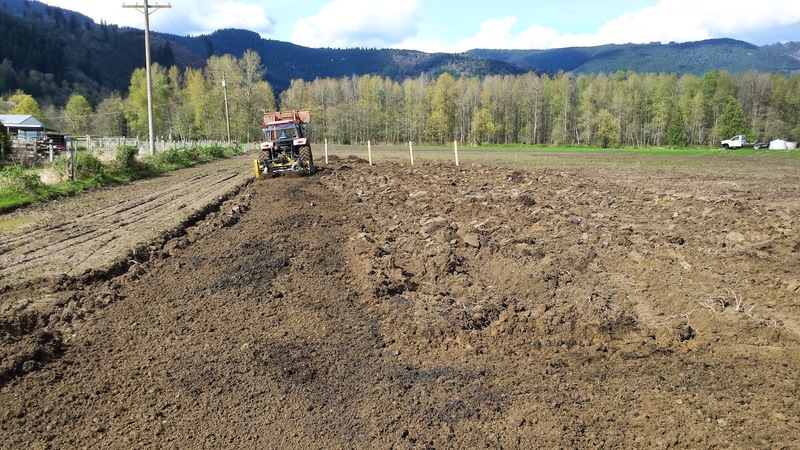 Unlike the rest of the tillable ground, there's a lot of rocks and not much soil and we drove the tractors around there when the soil was wet so there's some big ruts and dips. 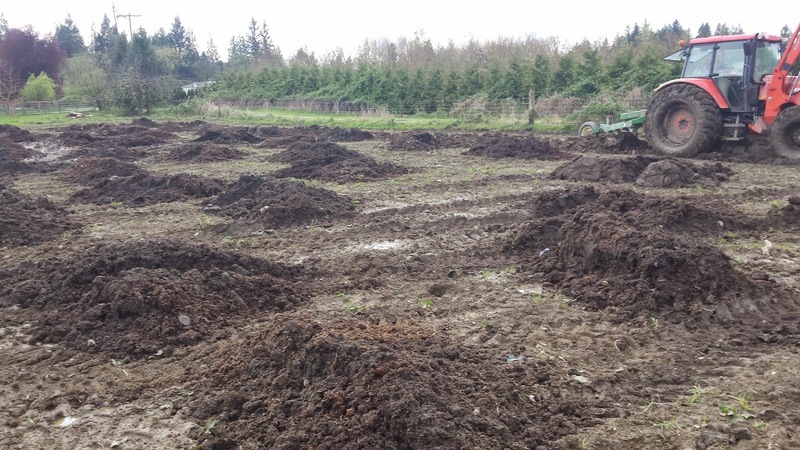 I've been stockpiling my manure solids there and encouraging the pigs to root in that area. The plan is to see if I can't borrow the vibratory screen the neighbor has and remove a bunch of the rocks, and then spread the manure and till it all in and add some topsoil depth. Smooth and pack it, and then plant with something. Probably grass/alfalfa, but it'll depend if I can get the ground in a shape that I feel happy with. There's a bunch of thistles around there that I really want gone, and a good green cover will help that. 30/70 alfalfa/grass is where I grew silage corn last year. Soil tests say it could use a bit of nitrogen and a bit of lime, so I'll add the lime and the alfalfa will help with the nitrogen. It'll probably be alfalfa for 2 to 4 years, depending on how long the stand lasts. I'm choosing 30/70 because the cows have indicated what they prefer by where they graze. It's pretty simple -- the dissapearance test. 3 or 4 times a day I look out on the field and note where the cows are grazing, and every day or two I'll walk out and check the grass condition. they have clearly indicated they like that mix of grass and alfalfa, and the butter they're producing is a lovely lemon/sun yellow as a result. 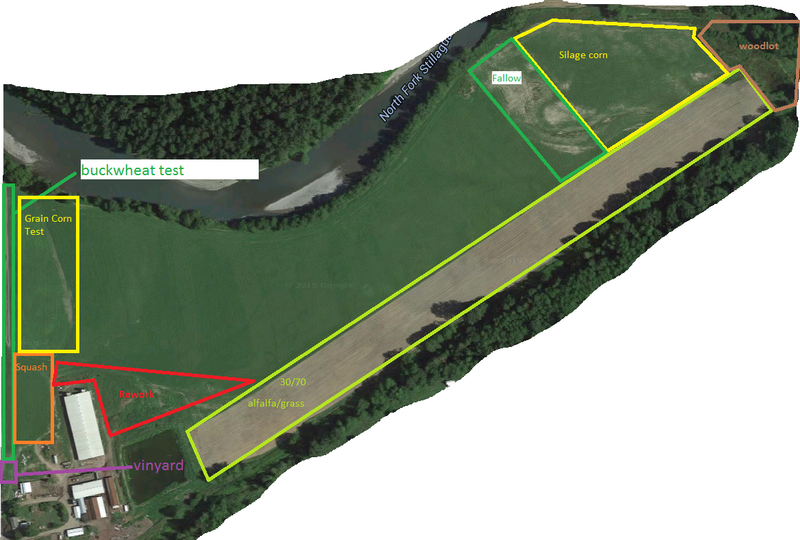 Woodlot is in the far right hand corner. 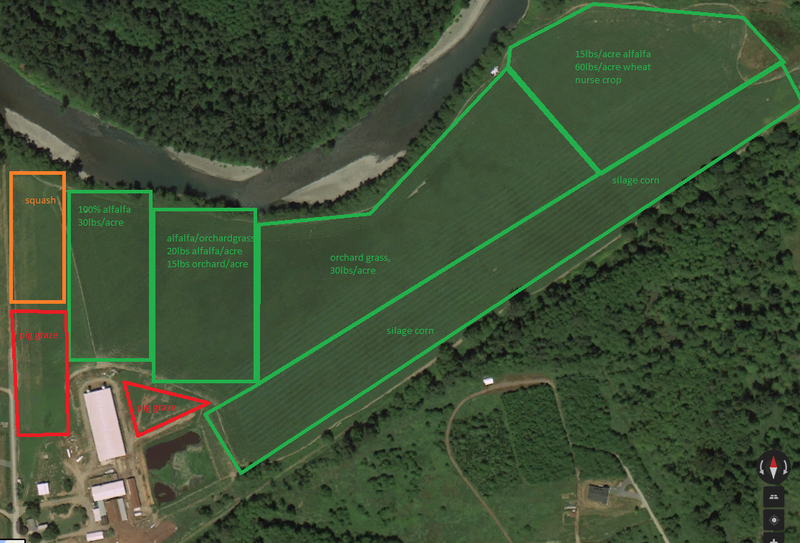 It's 5 acres of mostly-alder. Pretty big trees, maybe 25" in diameter, and enough of them fall over every year that it will supply wood for the wood stove that I'll be installing this year. I have propane heat, but I honestly prefer wood heat and wood heat works when the power fails, which it does with unfortunate regularity. Finally there's an area marked fallow. I'm going to leave a portion fallow for a second year because i'm curious what will happen. 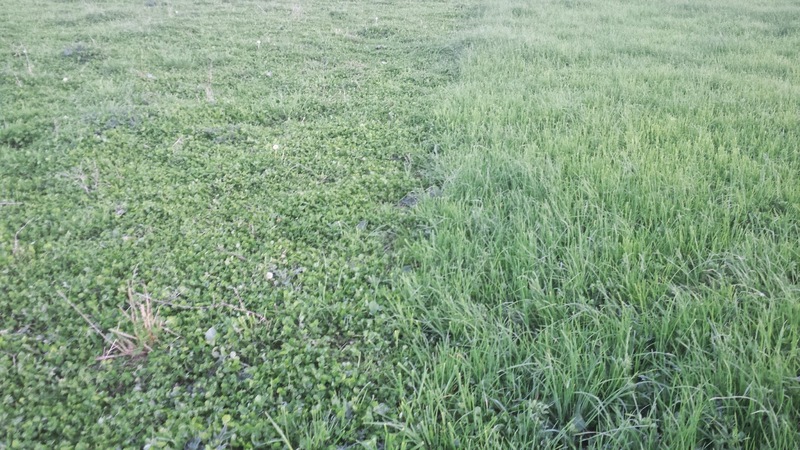 Clover adds to the soil fertility, and it's volunteer, and doesn't cost me anything. If it persists I may not need a cover crop. Just let the seedbank in the soil provide my cover crop. 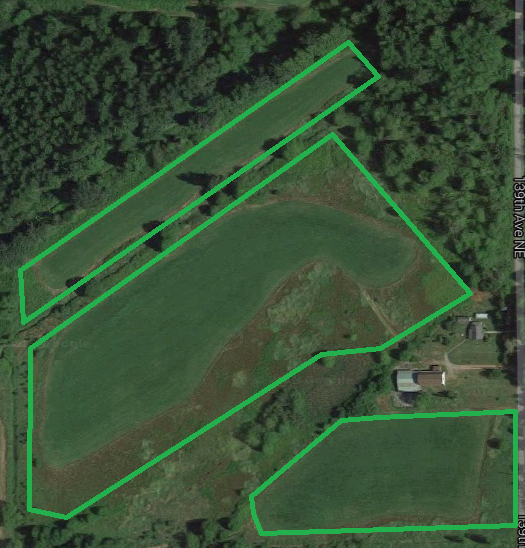 My total farmed acreage will go up from 70 to 110. Depending on how this neighbor feels about my work on his fields I may be able to add another 50 to 70 acres next year. Try this link to get to a corn calculator. It's one way that a farmer can get a feel for whether they will make a profit given the commodity price of corn and their expected yield. gives you a feel for what a lot of farmers are looking at this time of year, trying to figure out what they're going to plant, and how much, given expected falling corn prices this year. Why does it matter for me? My pigs do eat a fair bit of corn, in the form of the standard pig ration that we feed free-choice. My current feed buy is 10 tons every 6 weeks, for an average of about 1.5 tons consumed per week. 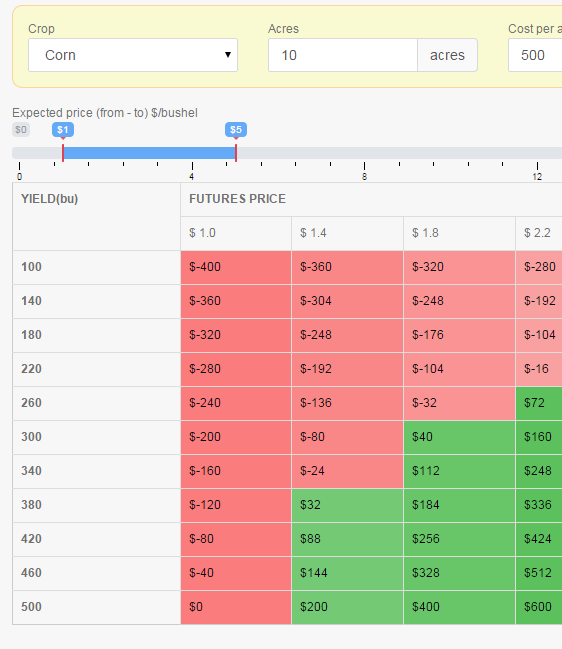 The cost of the feed is $380/ton, and I expect that to go down this year becuase of lower corn prices. two-three years ago that same feed was $540/ton. So for my field and my lack of corn-expertise, and to account for any mistakes that I might make, I'm going to say that if I planted corn I'd get 90 bushes/acre, or 2.5 tons/acre. I'm consuming 1.5 tons of feed a week, which works out to 78 tons a year, and about 75% of that feed is corn. So I'm consuming about 59 tons of corn per year, in the form of feed. so if I planted a little over 20 acres of corn, and somehow managed to harvest it, I'd have all the corn I needed to feed all the pigs for the year. To make it into a complete feed I'd have to add some protein, but this is an interesting thought. 78 tons at 380 a ton is $29,640 feed cost. 75% of that is $22,230 - so if I can plant, maintain and harvest 20 acres of corn for $22k, I'll break even. If I can do it for less I might save some money. But the math changes if the feed prices do indeed drop, as I expect them to. I like the idea of being vertically oriented; growing most of my own feed regardless of market conditions. But I don't like the idea of spending more than I have to. 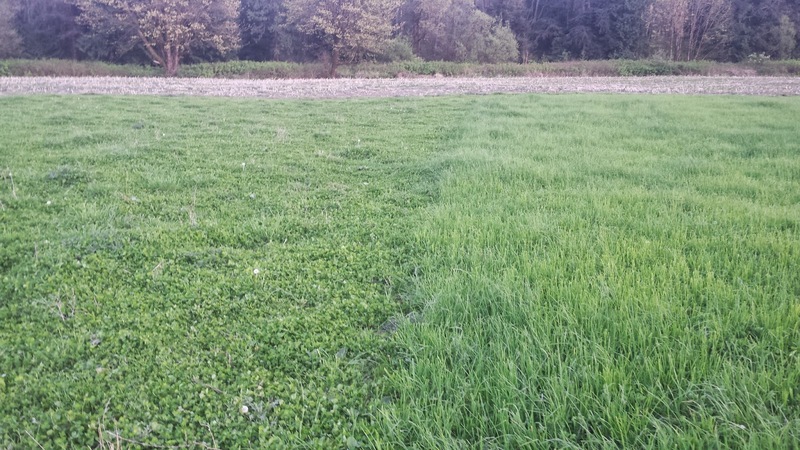 We're in the intensive grass growing season here and I spent part of the day today out in the fields looking at the grass and alfalfa and fallow areas of the farm. this is the mostly-orchard grass area. It looks like the grass has pretty much crowded out all of the weeds; it's a little under knee-high on me right now, maybe 13-15" tall. .
Next to that is the grass-alfalfa mix field. the alfalfa looks like it's a little overwhelmed, but it actually grows faster than the grass, and taller. So this looks good as well. This is an interesting area. to the left is the fallow area. I did till it, but planted no seeds there. 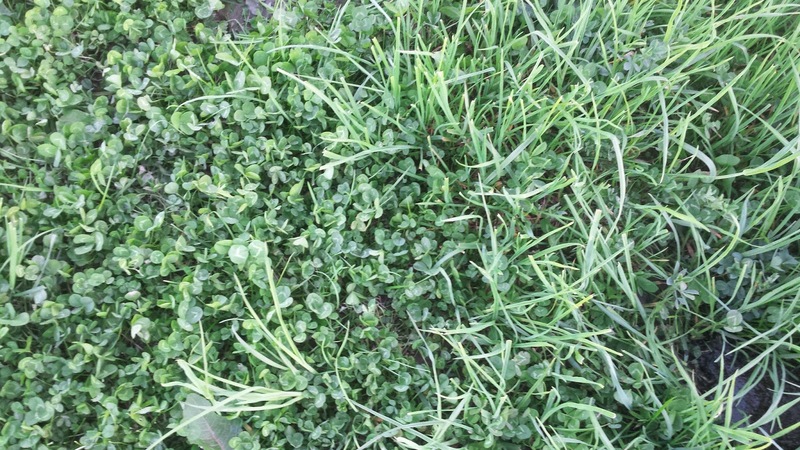 What came in, and in huge quantity, is white clover. 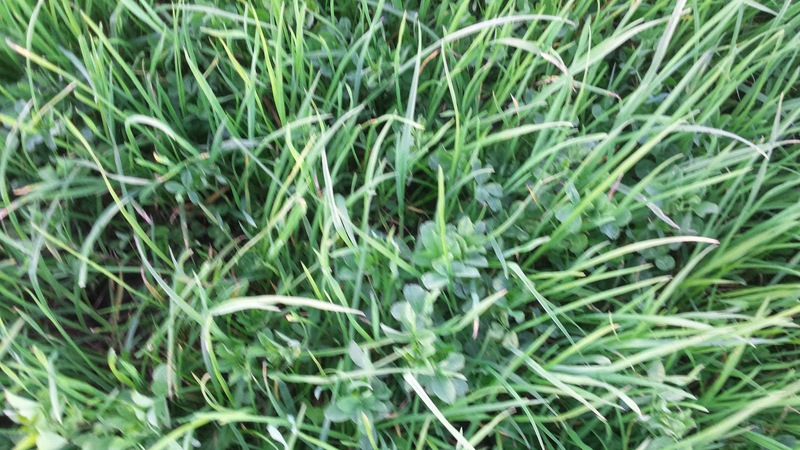 It's got a fair number of weeds, dandelions and cowslip and some plaintain, but most of the area is clover. it looks like I planted it. the line between planted and fallow is pretty sharp, and you can see a dramatic difference in what is growing there. The cows are choosing to graze on the alfalfa-grass mix sections of the field more than the pure-alfalfa. 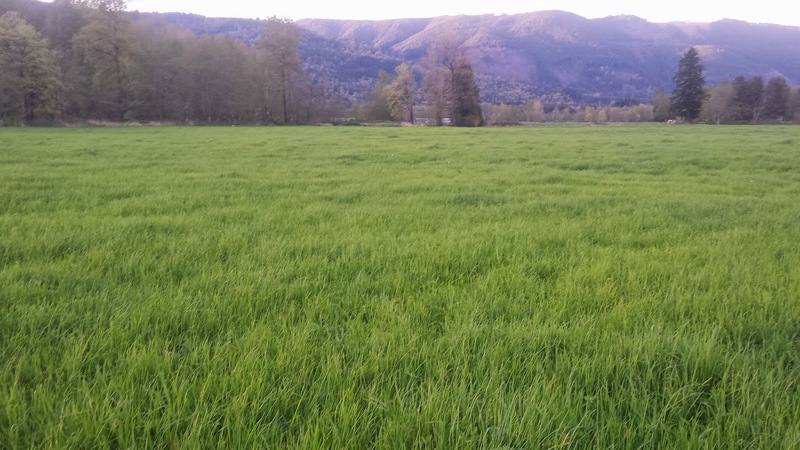 the most popular field is the 30% alfalfa, 70% orchard grass. since that's what they are telling me they prefer to eat, I'll be planting that mix in the corn area from last year. Edible plants for the yard: Tea? 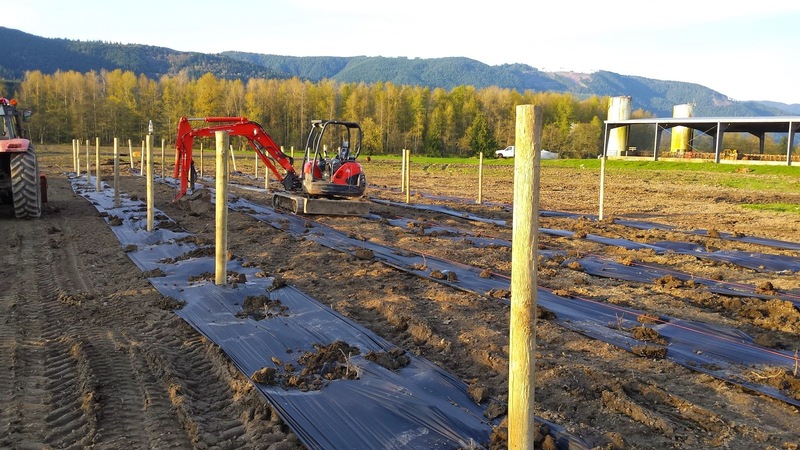 In the new vinyard I put in an extra line of trellis with the plan to put in some marionberries. You can order marionberries from all over, but I'd rather have some that were sourced from around here to get a better chance that the particular plant is suited for this climate. One of the local growers that had them also mentioned that they'd planted 5 acres of Camellia sinensis... which you probably know under another name. "Csinensis" by AxelBoldt at en.wikipedia - Transferred from en.wikipedia. Licensed under Public Domain via Wikimedia Commons. It has an attractive green foliage, it's an evergreen, and commercial plantations of it look like a trimmed hedge. All of it works for me as a sort of stealth edible. People think it's a hedge, but it's actually a tea tree. 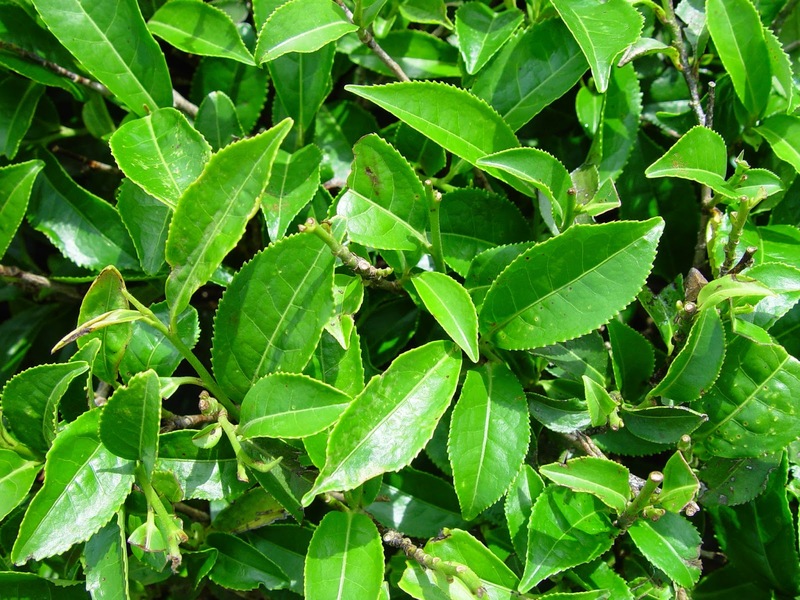 Dried leaves can be made into either green or black tea. Not a tea substitute -- this is the real deal. I think I'll get a few and plant them. really beautiful today. like postcard beautiful. I'm working on the vineyard, doing the final steps, and it's late in the afternoon and there's this horizontal light that 's just fantastic. I'm looking this direction as I notch the poles and tie the wire. 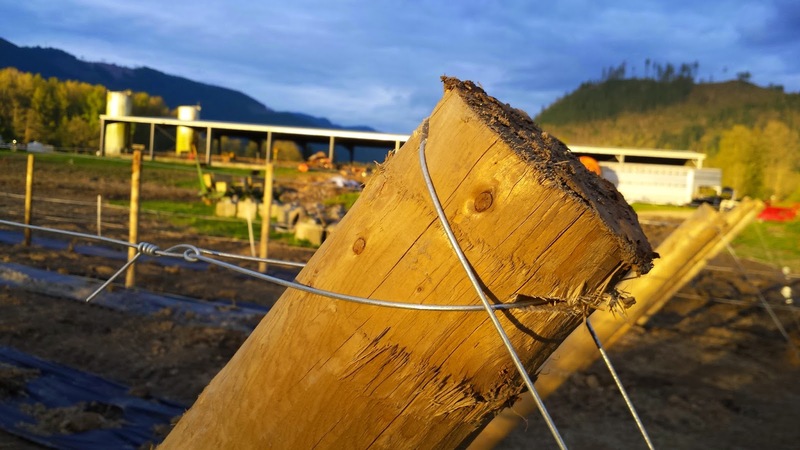 The notching is pretty quick; three chainsaw cuts to each post, loop of wire, some tying. But the light is just amazing. I hurry to get done, and then walk out into the field. and it's every bit as pretty as i thought it was from back there. It's moments like this that make me so glad that I chose to pursue my farm dream. I've been a big fan of knots and rigging for a very long time - I use it when I go rafting, for instance - and when I have a chance to learn a new knot or technique, I'm interested. In this case I'm putting up the wires for the grape trellis and supports, and took a few pictures as I worked on the wires. 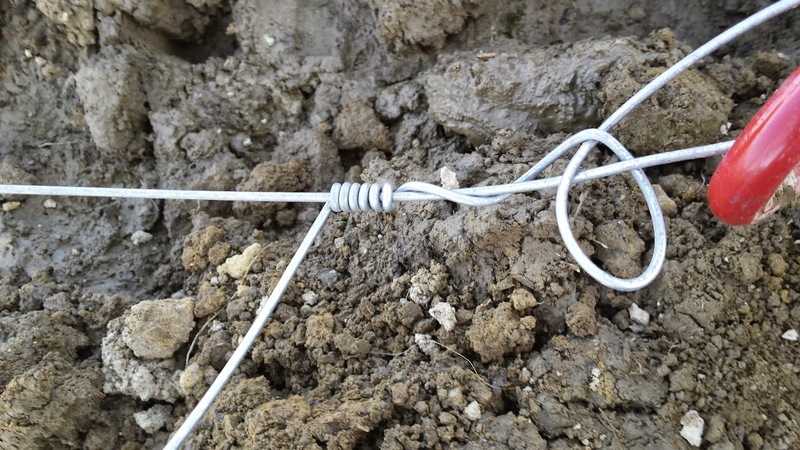 After the initial overhand knot I then make a series of tight wraps around the wire leading to the load. 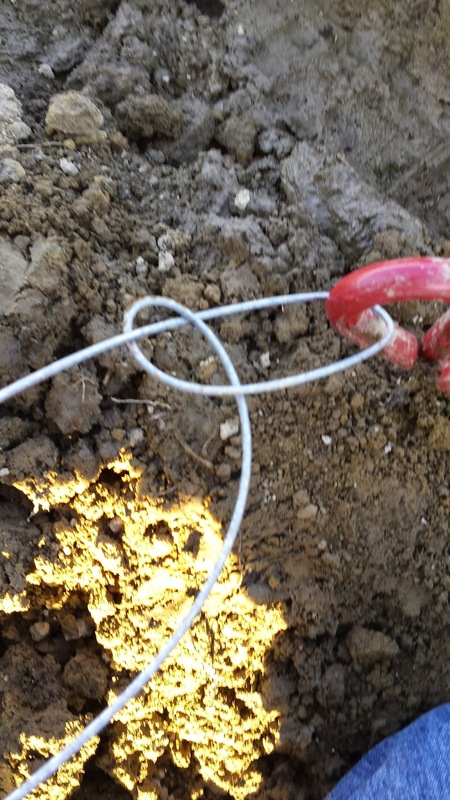 As I wind the wire I'm pulling back towards the ground anchor to keep the loops as close as possible. After making the loops I then unwind 1 loop, and working the free end back and forth, snap the wire off. Snapping it off like this leaves a smooth surface that won't cut you or livestock. If you cut it with diagonal cutters or wire cutters it'll leave a very sharp point; much prefer this. 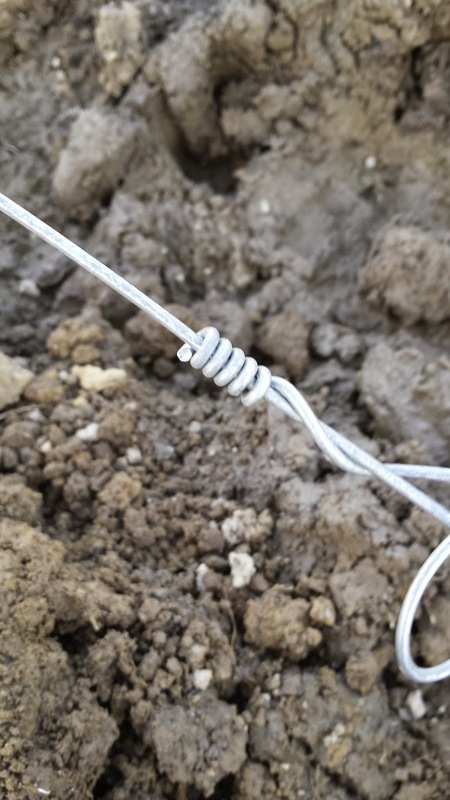 So when a wire breaks, I take a 6' piece of new wire out, tie the new wire in place, and then re-tension the span. 15 minutes, no tools, just a bit of wire and good technique. makes fence repairs very easy. When I was looking for information on building a vinyard I ran across a couple of differnet cost estimates for vinyards in California. 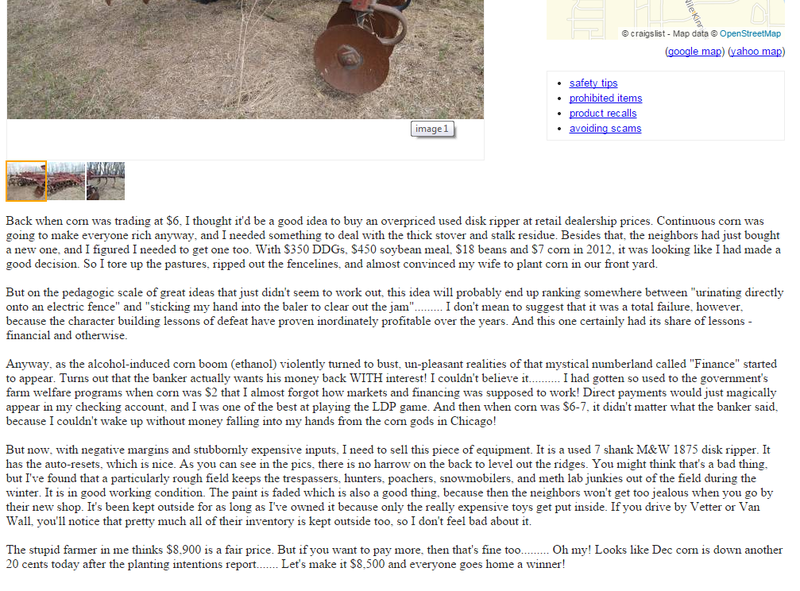 They quoted good vinyard land at $125,000/acre OR MORE (!!!) 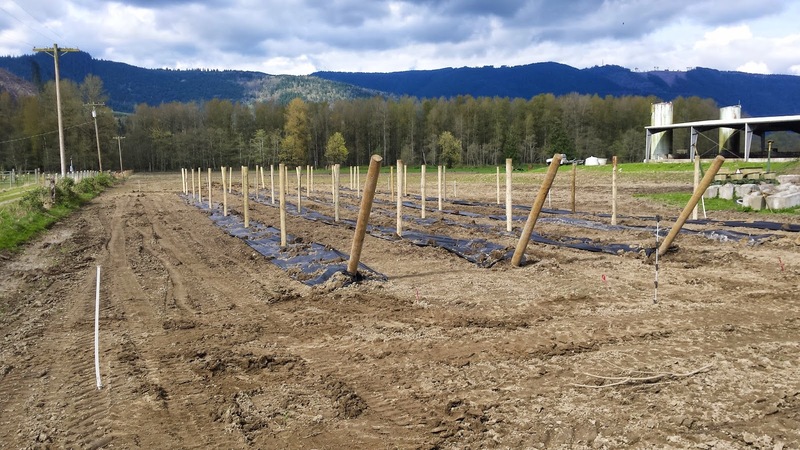 and the costs of establishing a vinyard at $30k/acre, with two more years at $3-5k/acre, for a total sunk cost of $40k per acre before you get y our first harvest. That seems pretty amazing. No wonder wine sells for so much. They've got huge capital costs! 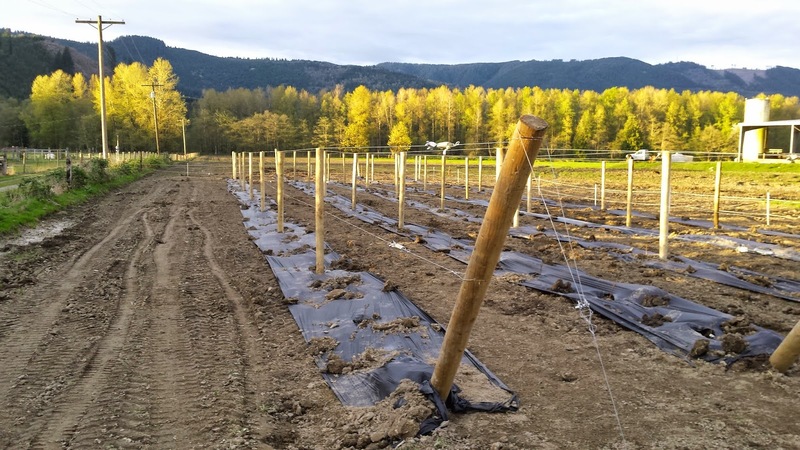 Mine is a little cheaper; my total cost for this vinyard - prep, posts, wire, plastic, plants - would be around $2800 an acre. So for my little quarter-acre vinyard I'm at roughly $700. 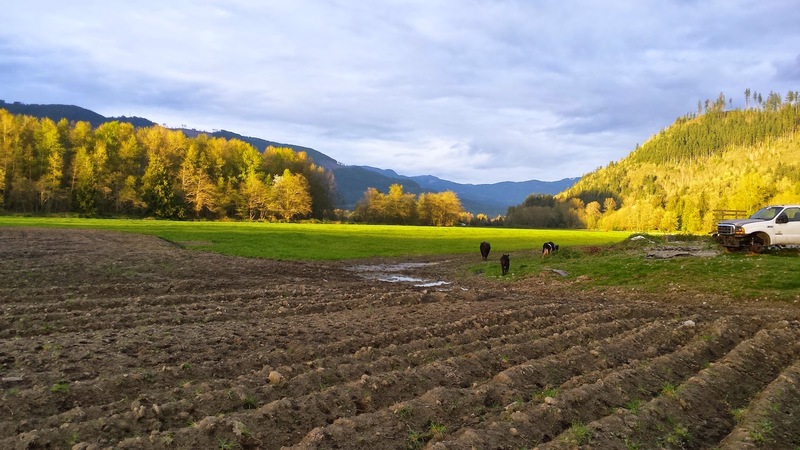 The land itself I purchased for $6k/acre -- so what folks down in california think is reasonably price at $160,000 costs me in washington roughly $10k on an acre-basis. Good soil, no rocks. Posts push right in. 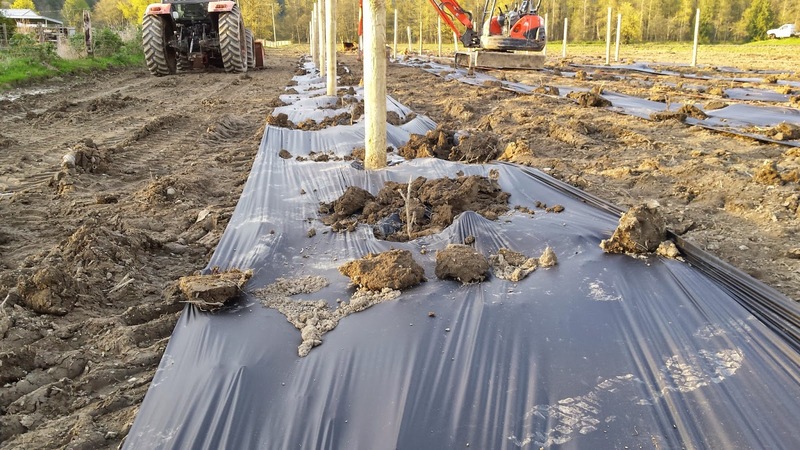 Black plastic layed down to discourage in-row weeds. I've planted a cover crop of grass and alfalfa between the rows to out-compete the weeds, and I'll watch to see how that goes. If it doesn't work I'll just rototill the strips between the vines now and then. table/juice/wine grapes; 4 varieties in all, 100 vines. Grapes are a relatively permanent crop; so any soil amendment I do is best done now. 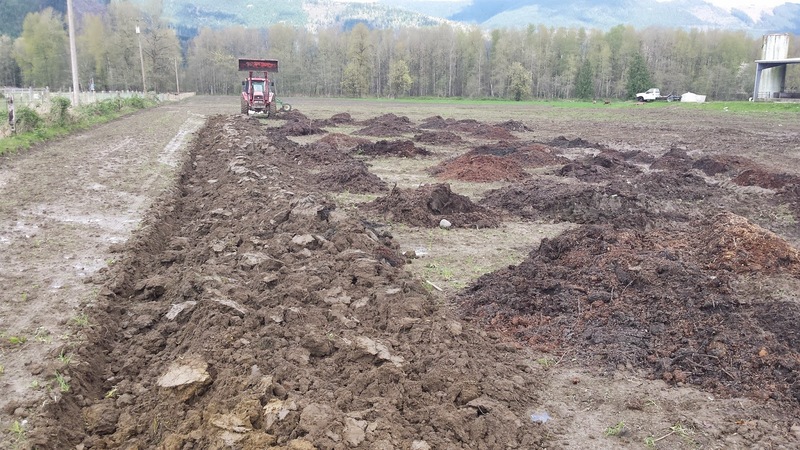 I put composted manure down at a rate of 16 tons per acre, which sounds like a lot, but we're only talking about 1/4 acre, so I put down a little over 4 tons of compost. Just brought it over with a dump truck and then used the front loader on the tractor to distribute it around the area to be planted. 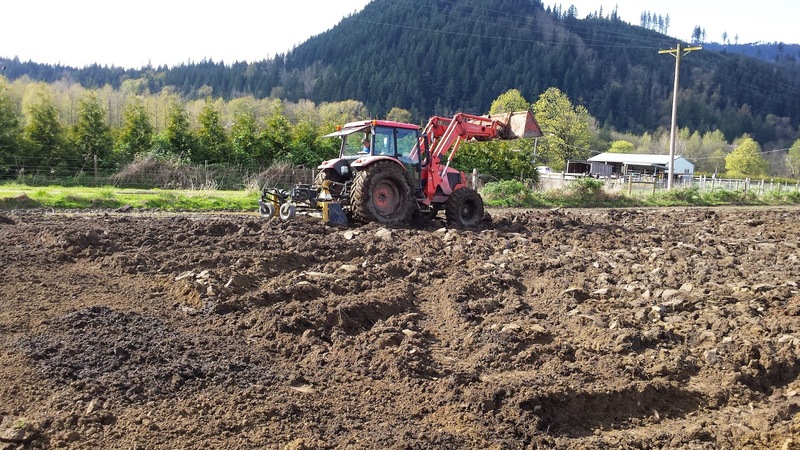 Once the manure is down, I run the plow over the ground to mix the compost with the soil. I grab Sean and he and I work on driving the posts in; a chainsaw carves a point into an 8" treated post, and the trackhoe bucket pushes it into the soil about 5' (they're 10' posts). 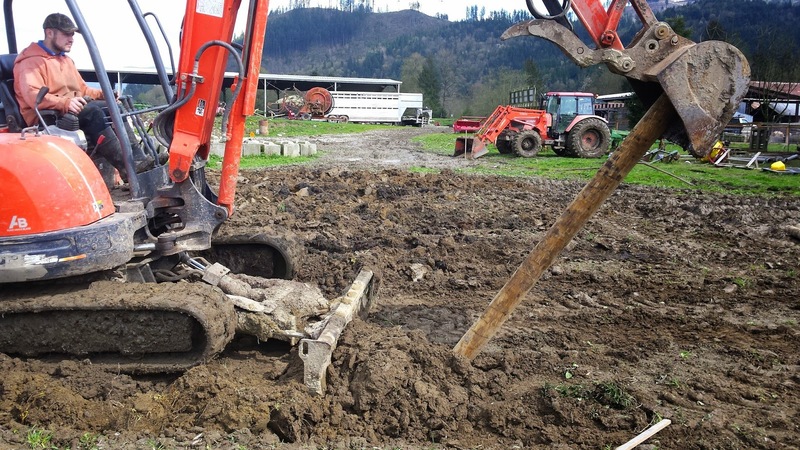 once the posts are down, a couple of passes over it with the harley rake smooths out the tire tracks and breaks up the dirt clods and further mixes the compost and soil. it leaves a smooth seedbed behind. I finished today by putting in the ground anchors that will hold the end-of-line posts down. I'll finish the prep and planting tommorow. Partly sunny day; nice working weather. maybe 60 degrees. Very pleasant. 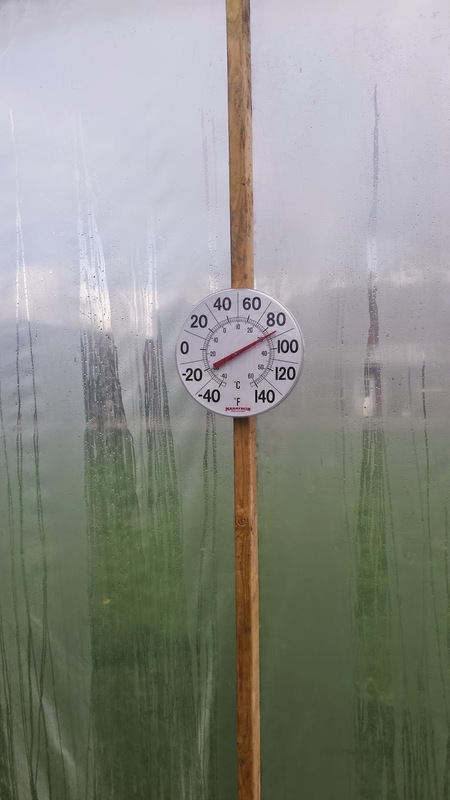 Greenhouse at 90 degrees again today -- good for the plants that are germinating right now. Little pigs don't have any fat at all. they're very, very lean, and they love heat. These little guys are enjoying a heat pad underneath them, and a heat lamp above them; they're about 10 hours old. I use the heat pads in because the piglets like to sleep on them and there's a very low risk of barn fire when they're used. 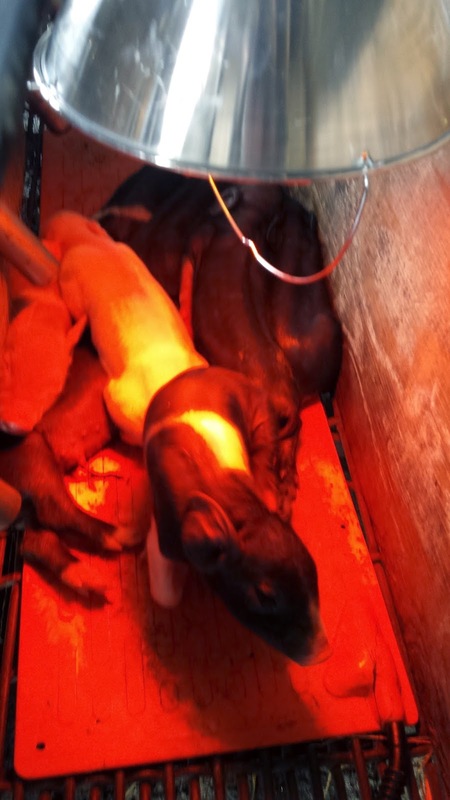 But the newborn piglets don't figure it out as fast as I would like them to unless I put a heat lamp in there, too. the light and heat of the lamp draws the piglets out, and provides a very warm spot - you'll see the newborns wobbling around on uncertain legs, and then stop and visibly relax when they feel the heat of the lamp; the shivering goes away, and they stand there until they're warm enough, and then wobble off on piglet business. but a couple of good warming sessions and i don't have to teach the pigs any more about heat -- most of the time I'll find them all glued to the heat pad, soaking up the warmth. the greenhouse is warming up, too. It's about 55 degrees outside, partly cloudy, and it's a balmy 90 degrees in the greenhouse. Perfect weather for sprouting seeds. 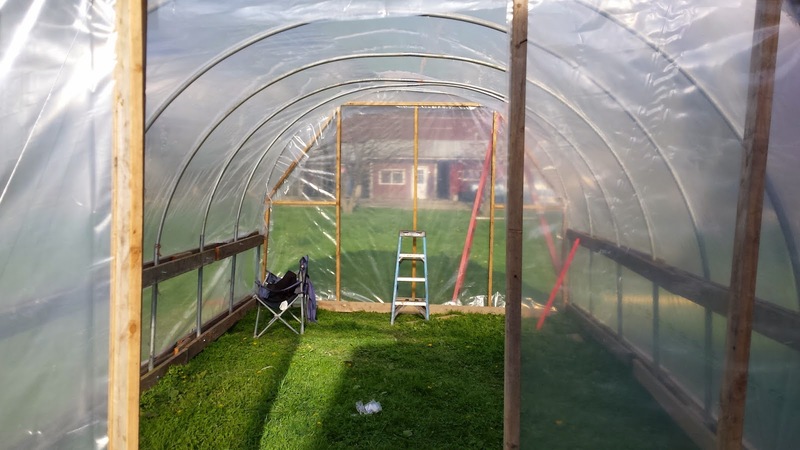 the 90 degree weather inside will warm the ground, and that warmth will keep the greenhouse 10 to 15 degrees above outside temperature over the evening, and then warm up in the morning. 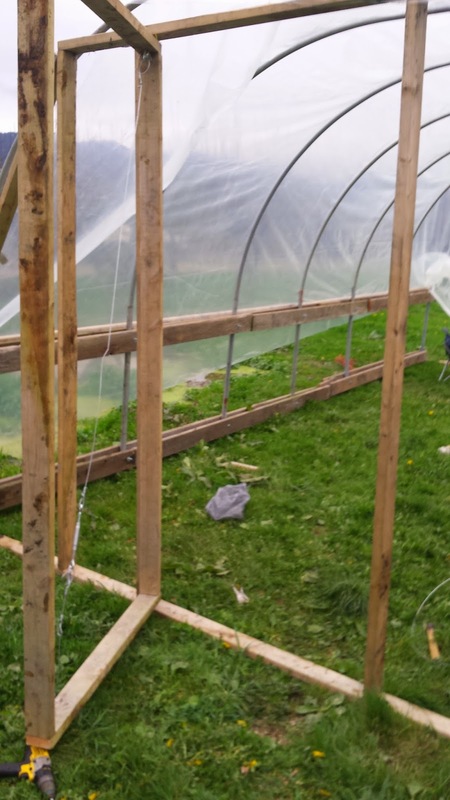 greenhouse, showing end wall framing and side rails. greenhosue door framing, before plastic applied. leaving 2" of clearance at the bottom of the door (for dirt buildup over time). the door is framed with 2x4, with a pair of eye bolts mounted on diagonal corners and a turnbuckle in the center to tighten it up. It's not a heavy-duty door, but then, it's not doing a heavy-duty task. It'll last 3 or 4 years and then need to be redone, about the same time as the plastic covering of the greenhouse itself. Overall feed prices are down about 40% from their peak 18 months ago. Which is good for me; but the farmers who got used to record corn prices... well, they're kinda smarting right now. Below you'll find an unusually blunt ad selling an implement.